For additional Bucket Filler ideas>> Are You A Bucket Filler? This is an extension of my Are You a Bucket Filler? Printable activity packet. 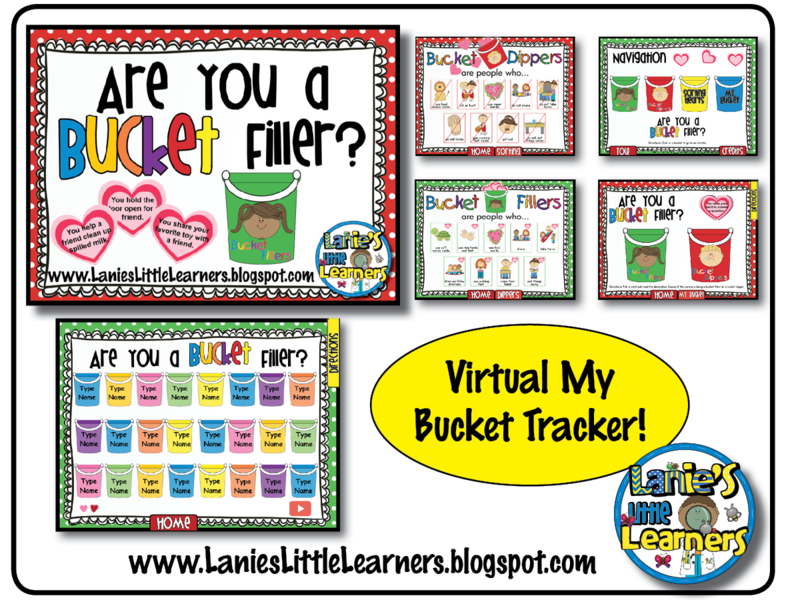 I have used the same posters and sorting cards, but have added the virtual individual fill My Bucket Tracking. My Bucket: Instead of using individual buckets for all students to see, use the SMARTBoard version to keep track of Bucket Fillers in the classroom. Each bucket can be personalized with a student’s name. If the student is caught filling someone’s bucket add a heart. If the student is caught dipping into someone else’s bucket, take a heart. Then as a class decide on what type of rewards for getting X amount of hearts by the end of the day, or week. Click on the link to learn how to change names, group, and lock buckets. Also how to add and take away hearts. Sorting Hearts Sort the hearts by bucket filler or dipper. To re-set the self- checking game: Click on ACTIVITY BUILDER>RESET ALL. This resets the game pieces to their original location. SED3.4a Independently follows rules and routines. SED3.4b Regulates own emotions and behaviors, and seeks out adult support when needed. APL3.4c Works cooperatively with others to successfully achieve a goal or accomplish a task. CD-SS2.4a Identifies and follows rules of the classroom community and displays competence in engaging in appropriate social behavior.